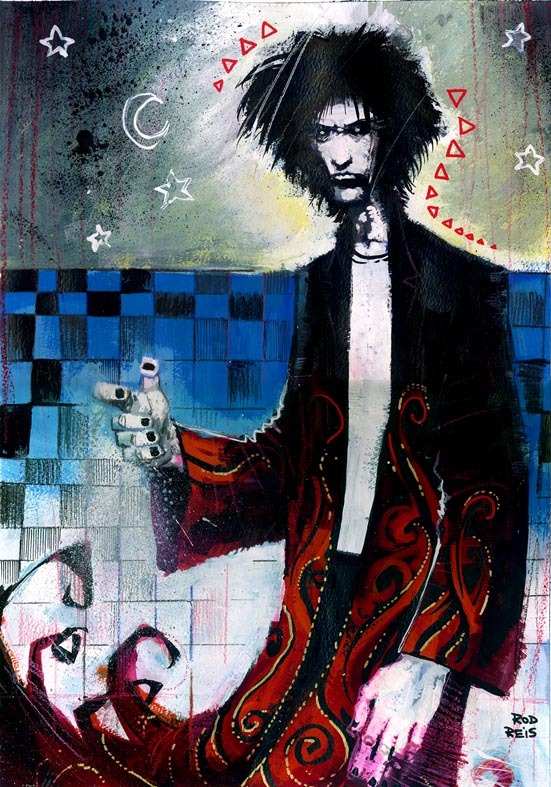 I'm a really harsh judge on people who draw Daniel, from Sandman, and not because of the name thing. He's just a deceptively tricky character to get right. Here Rod nails his gaze and thereby the whole character - his eyes truly look endless! 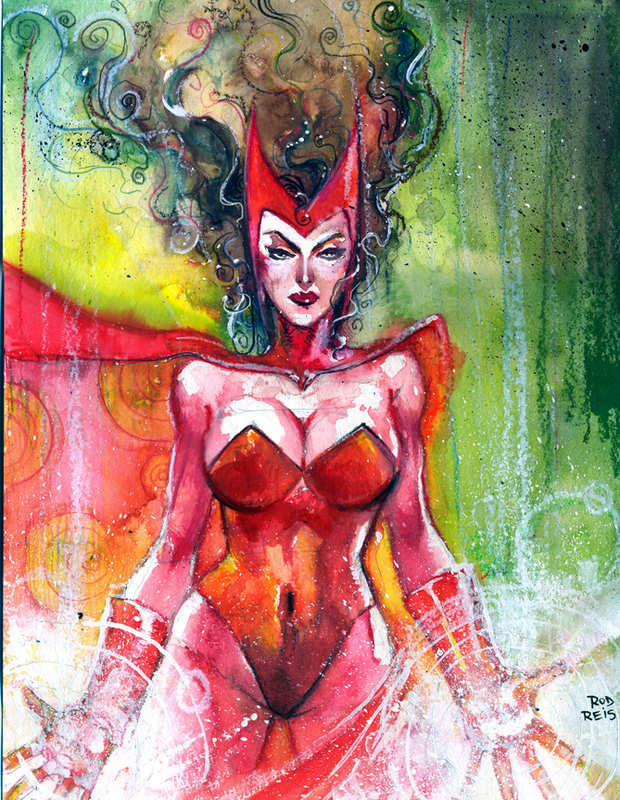 The Scarlet Witch fits perfectly into the Sandman universe in this image. The curls of her hair, the surreal colours and the markings of her powers put this Avenger into an all-new state of mind. There is something about this Brazilian's art that makes me think of Jim Dine's painted tools and figure series'. 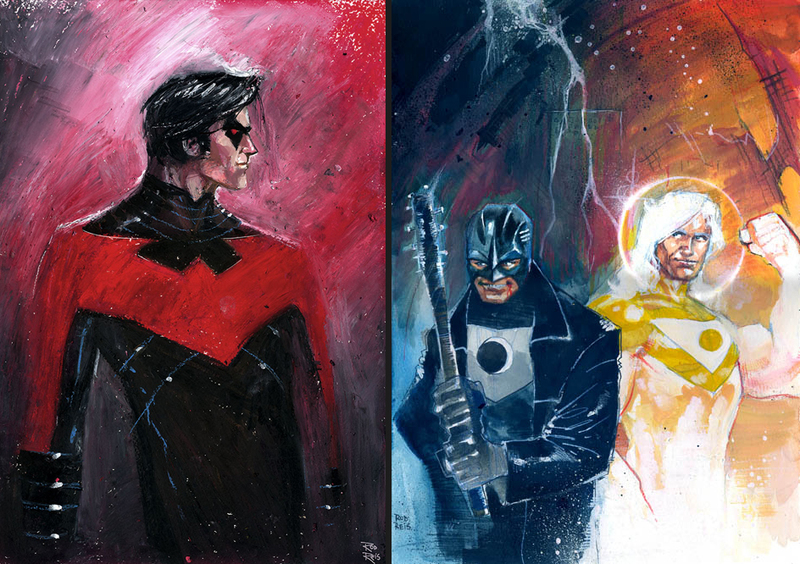 Reis's pieces, especially Nightwing below, share the same scratchy illusion of space! Apollo and Midnighter continue on a similar vein. If this piece looks familiar, it is because Rod once offered it as a print, and rightly so - it's fantastic! What do you think? Let me know below or to see Rod's full gallery for yourself click the jump! Some people think all you have to do for Daniel or Morpheus is draw someone vaguely elongated, a little goth, maybe put a bit of glint in the eye, and every once in a while glance at a picture of Neil Gaiman. While this might give you the briefest outline of Dream, it doesn't exactly do him justice, in either aspect. The drawing, and the painting needs to go deeper, just as the writing of the character does. This does. Oh boy, does it. Click. Save. Study. Enjoy. Thought you'd like this one Random, glad I was right!